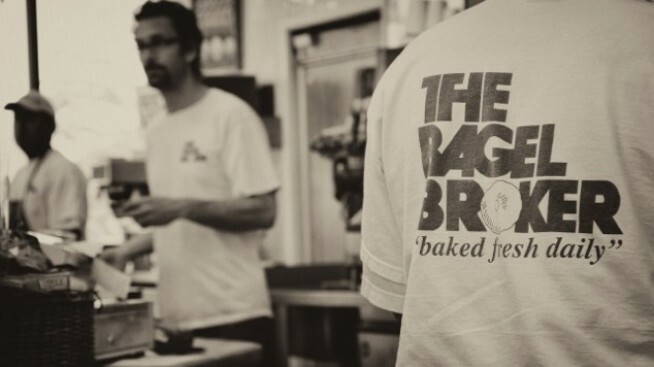 The Bagel Broker turns 25 with a month-long party. The Bagel Broker of Beverly Boulevard turns 25 with an August full of specials. If you've been on a film set, or at a television studio, or at an office that orders breakfast in, and you're anywhere in the Hollywood/West Hollywood/Fairfax vicinity, chances are you've eaten something freshly toasted from The Bagel Broker. The Beverly Boulevard bagelry is not only the go-to stop for the person on the morning office run, it regularly delivers to various movie shoots around town (and occasionally stars on screen, too, as it did in "Entourage"). Now the bready staple shop is gearing up to mark a big anniversary: 25 years. The eatery's birthday is on Wednesday, Aug. 1, but it will keep the party going each Wednesday during the month. Our favorite? Dress like 1987 -- the Bagel Broker's birth year -- and show up at the shop on Wednesday, Aug. 8, and you'll nab six free bagels. Please. You probably kind of still dress like 1987 now, since the look back then was hot. Leggings? Baby doll dresses? They're in your closet. Our next favorite happens the following Wednesday, Aug. 15. If you were in school in 1987, show at the shop with your yearbook and get a dozen bagels totally for free. And if you were born in 1987, you'll want to make for the Broker on Aug. 29 with your driver's license. What's your takeaway? A dozen gratis bagels. It's all pretty cute and fitting for a shop that's been part of the community for a quarter century. Happy birthday, Bagel Broker. We'll take an everything bagel, lightly toasted, extra schmear, please.